Hello! NCCBF Scavenger Hunt Committee here and we wanted to teach you how to play the Scavenger Hunt games. First off, what is the NCCBF Scavenger Hunt? Officially, we are the Northern California Cherry Blossom Festival Scavenger Hunt (wow! That’s a mouthful). We are exclusive to the Festival in that we help you discover all the treasures the Festival and Japantown has to offer. At the same time, we want to help educate you, festival goers, on the history and present of our community all while having fun! So…. How do I play? Go to your phone’s app store, and download the app GooseChase. 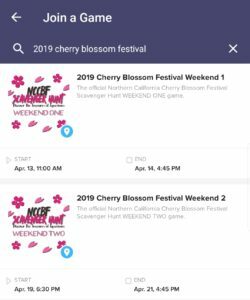 Within GooseChase, search for 2019 Cherry Blossom Festival and choose which weekend you wish to play. Weekend 1 occurs during April 13 thru April 14 and Weekend 2 occurs the evening of April 19 thru April 21. Next, create your team! Whether it’s with family and friends or if you’re a lone wolf on the hunt and are up to the challenge, create your team and share your team’s code with your friends for them to join you. Keep track of where you’re at on the leaderboard to get the top spot and increase your chances of winning a top prize! This year, we have prizes from TOTO, JINS, Asian Art Museum, Paper Tree, Matcha Cafe Maiko, and more! Top 3 winners from each weekend are eligible to win a prize. Top prizes will be distributed at Homebase 1* at JCCCNC between 4:45pm – 5:30pm on the Sunday of each weekend. Opportunity to win raffle tickets is also available! Consolation prizes will be given if you can’t make it for both days and can be picked up during your game or when you are done. Please note, that if you win a top prize during weekend one, you will not be eligible to win a top prize during weekend two so that we can give the opportunity for other players to win a prize. Joining a new team will still make you ineligible. If you’re looking for something more easy-going and family-friendly, especially for the little ones, we have a Kid-Friendly edition to visit 10 interactive spots throughout the Festival. Each weekend gives you an opportunity to check out different spots! Pick up your game card at one of our home bases and have fun! ** For each interactive activity you do, you will receive a stamp. Once you get all 10 stamps, come back to one of our home bases to get a final stamp of approval and claim your prize from our treasure chest. We can’t wait to see what you all have discovered and learned and hope you have so much fun while at it! There are many wonderful treasures our community has to share with you, all run 1000% on volunteering power so don’t forget to thank a volunteer for their time in making a great experience for you. We want to thank the Festival and our sponsor, Japan Center Mall, for all their support on our 3rd year as part of the Northern California Cherry Blossom Festival. * Homebase 1 is at the Japanese Cultural and Community Center of Northern California (JCCCNC) at 1840 Sutter St between Webster St and Buchanan St.
** Homebase 2 is at Info Booth located in the Peace Plaza next to the Japan Center East Mall entrance.